Virginia is 26 years old and the mother of four children. Her husband works as a tailor’s assistant, and together they have worked hard to feed all of her children and send them to school. Despite this, they’ve often struggled to afford the cost of school and nutritious food like fruits, vegetables and meat. When two of her eldest children joined Canadian Feed The Children’s Sponsor a Child program and a corresponding after-school program, her children received support with their homework, improved their reading skills, and began having access to fruit and vegetables. Then Virginia was invited to participate in a food security program where she learned how to grow vegetables in her own garden. Her husband was skeptical at first, and wasn’t sure it would be worth her time. The outcome surprised them both – now Virginia is able to feed her children fruits and vegetables from her garden and she can sell the surplus at market to earn an income. 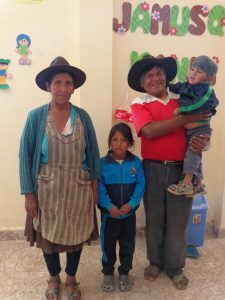 Like many families that Canadian Feed The Children’s donors support, Serapio and Eusebia are the primary guardians for four of their grandchildren. In Bolivia, when parents are unable to provide a healthy environment for their children, the responsibility often falls upon the grandparents’ shoulders. After raising six adult children, Serapio and Eusebia have struggled to take on an additional four children under their care. At times they were unable to afford good food to eat, or the children’s school fees. Serapio did his best working as a daily labourer and producing a small amount of produce (potatoes and wheat) for sale. Canadian Feed The Children invited the four children into the child sponsorship program, with the eldest child participating in the after-school program and two of the youngest attending the early childhood development program. With both grandparents illiterate, having extra help for homework has made a big difference for the kids. 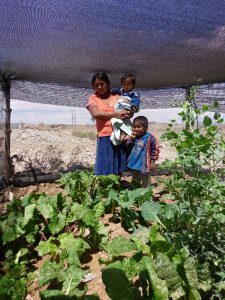 Serapio and Eusebia also learned how to grow vegetables like onions, chard and lettuce in the garden, which has helped provide the children with essential nutrition they were not receiving before.